A business leader and esteemed economic thinker outlines simple solutions to America’s five most pressing public policy issues, from healthcare to education to inequality. America today confronts a host of urgent problems, many of them seemingly intractable, but some we are entirely capable of solving. 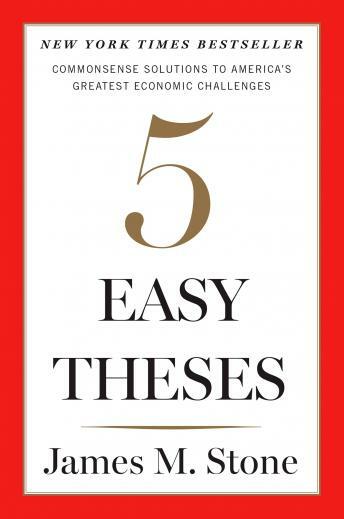 In Five Easy Theses, James M. Stone presents specific, common-sense solutions to a handful of our most pressing challenges, showing how simple it would be to shore up Social Security, rein in an out-of-control financial sector, reduce inequality, and make healthcare and education better and more affordable. The means are right in front of us, Stone explains, in various policy options that — if implemented — could preserve or enhance government revenue while also channeling the national economy toward the greater good. Accessible and thought provoking, Five Easy Theses reveals that a more democratic, prosperous America is well within our reach.